The URL Mapping Tool has a new look, so we’re creating this post to help you to make a smooth transition. Below, we’ve provided screen shots, descriptions and reasons for using different options, so let’s jump into it! First things first; why use the HubSpot CMS URL Mapping Tool? “URL mappings allow you to control how URLs are handled on your site. You can redirect URLs to a new destination, allowing you to manage your older pages without visitors seeing error messages” (HubSpot). Not Sure Which Pages are Returning an Error Message? There are multiple ways in which you can find a list of your site’s errors, but the most accessible way is to use Google Webmasters. Once you’re logged in, you’ll see 3 calls-to-action on your dashboard. 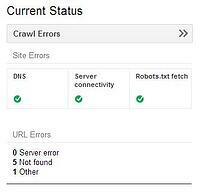 Find the section for crawl errors, and click on the “Crawl Errors” button. Once you’re on the “Site Errors” page, you’ll see three tabs for Server Error, Not Found and Other. You’ll find any 404 page errors on the “Not Found” tab. Go ahead and download that report to CSV, and you’re ready to begin mapping! 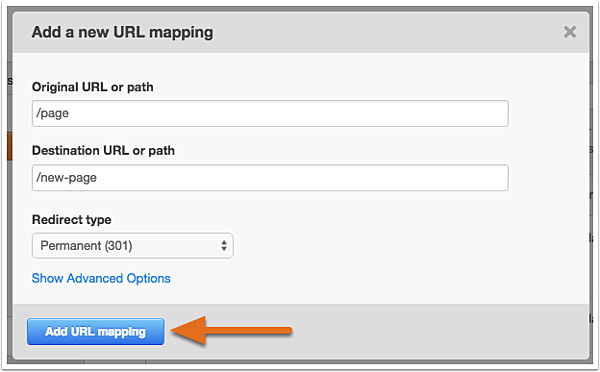 To use the HubSpot CMS URL Mapping Tool, you’ll have two options: you can either add one URL mapping at a time or you can bulk add URL mappings. Depending on how many redirects you’d like to implement, you may want to choose one option over the other. If you have 5 mappings like we do now, it may be timelier to just add singular mappings. However, I typically recommend using the bulk tool to save some time and effort. Pull list of URLs in CSV formatting (If your list isn’t in CSV formatting, you’ll be able to choose CSV under “Save as type” options under the "Save as" menu). Format with 2 columns – old URLs in the first column, and the new URLs that you’d like to direct that traffic towards in the second column. You can either include full URLs, “http://www.newbreedmarketing.com/full-url” or you can use the relative links, “/relative-link-style”. To be safe, you’ll want to use the relative link style only when you’re dealing with your main domain. If you’re using subdomains, or other domains in general, it’s a safe bet to use the full URL styling. Now that you’ve got your URLs all mapped out and saved as a CSV file, you’re ready to add them to the bulk uploader. To access the CMS URL Mapping Tool you’ll want to click on Content > Content Settings > and then under the “Content Optimization System Options” menu on the top left hand side, CMS URL Mappings. Select the two columns of URL mappings in your CSV document, copy them, and then paste them into the “URL mapping redirects” text box. Make sure the “Separator type” is set as a comma, or the character used between the old URL and the new URL. If you’re unsure, copy and paste the character that’s used within the URL mapping redirects text box. You may or may not want to check the box at the bottom that says, “Update existing mappings with new destinations in case of conflict” depending on what you’d like. This will replace any duplicate old URLs since you can’t have 2 different redirects off of one URL. If you don’t check this box and there are duplicates, the tool will automatically give priority to the uppermost mapping, which you can see in the mapping dashboard. Hit “Add URL Mappings” and you’re good to go! If you’re having trouble uploading URLs from a CSV format, you can try copying and pasting the URLs from a text editor instead. The bulk uploader only allows 100 mappings at a time, so if your mappings exceed this number, you’ll have to split them into groups and upload multiple times. You will want to check this box if the original URL is only temporarily down, or if you’d like to republish the page at any point in time. We often use this with our career pages as we grow – we fill a position so we take the page down, but then a few months later we need to hire another employee. We put the page up again, but in the meantime, we don’t want people landing on a 404 page. Instead, we redirect them to our careers page. This box is used to redirect a certain group of URLs using parameters that you set. We often use this functionality during website redesigns to bring over an entire group of pages such as a blog.To use this box, you’ll probably want to have some coding experience, but it’s certainly easy enough to implement once you have the right pattern laid out. Under this drop down, you’ll want to select whether the redirect is permanent or temporary. Refer to my example under the second bullet for an example of why you’d want to use a temporary redirect. Now it’s time to click “Add URL mapping,” and you’re good to go! Chances are, adding in 301 redirects won’t be a one-time process. I recommend checking your Webmasters account frequently to evaluate and update any site errors. This will not only help to keep visitors on your site, but it will also help improve your search engine optimization. Through tools such as Moz, you can also track where the 404 error is linked from and how many times people have landed on the 404 page. You may want to consider reaching out to the referrer to ask them to update the URL on their site page. Or, if you’re noticing that the particular 404 link draws a lot of traffic, you may want to consider creating a relevant page using that URL to catch and keep that traffic. It’s surprising, at times, the amount of insight you can gain from error pages on your website!